I recently had the misfortune to lose two of my husband’s family members. This brother/sister team lived together and shared living expenses. They also had wills leaving their estate to the remaining sibling. My sister-in-law's reply to anything concerning her pending demise was “once I’m gone, I don’t care.” I found this to be a rather selfish attitude and did on a few occasions suggest making a list of her wishes or at the very least putting her benefactor’s names on treasured items. Neither happened and shortly after her passing her brother changed his will and so her chattels were left to their executor’s discretion. Unfortunately, only a minority of people follow Roy’s advice, which may lead to family disputes, tax issues, and personal finance fiascos to name just a few. I remembered my Girl Guide motto: Be Prepared! Sage advice, I thought, which prompted me to write this article. I’ve learned that one should not appoint an executor without a notarized listing of personal items and the beneficiaries. It makes the executor’s duties much easier and eliminates possible tension amongst family members. I’ve learned that the gift of giving when alive, to experience the benefactor’s pleasure in receiving far outweighs a lawyer’s impersonal letter. 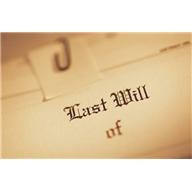 I’ve learned that family attitudes vary greatly when dealing with an inheritance. I’ve also learned that the role of the executor is a bigger job than you may think. That person will need to know a lot about you. There’s all that personal information, location of important documents like the will, funeral arrangements, cemetery plot, bank accounts, investments, real estate, life insurance, credit cards, pensions, safety deposit box, household accounts -- the list goes on -- right down to the deceased's Christmas card list, which is a very good resource for notifying all his/her friends of the death. Who would have thought the role of executor could last for months? Who among one's friends are capable or have the time to deal with these matters? Maybe a person should consider using a professional. These are all questions that should be dealt with well in advance of any health issues or unforeseen misfortunes. Remember, it’s not only senior citizens who pass on, death has no age limit and so it’s best to “Be Prepared”. And Roy agrees, he says, “My best advice is to add a single word to a certain sports company's slogan "Just do it - NOW" . Do not wait until the time you think you will need it”.